Govt. 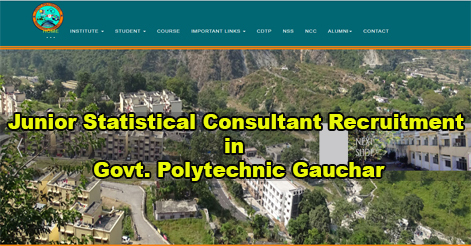 Polytechnic College Gauchar, Chamoli has released notification for the recruitment of Junior Statistical Consultant on a contractual basis. The recruitment is purely under the Community Development through Polytechnics Scheme (Ministry of Skill Development and Entrepreneurship, Funded by Government of India) run at Govt. Polytechnic, Gauchar Chamoli. Interested candidates may attend the Walk-in-Interview on 25 Feb 2019 at Govt. Polytechnic College Gauchar. Note: Knowledge of Hindi and English typing is also mandatory, with the experience of working efficiently in Word, Excel, PowerPoint, and the Internet for the said position. The selection of candidates will be done on the basis of their performance in the interview. Candidates may attend the walk-in interview that will be held on 25 Feb 2019 from 10:00 AM. Candidates are required to bring all original certificates, testimonials, and publications etc. along with two Xerox set of all the certificates for the interview. Help us to improve this article/job posting "Consultant Recruitment in Govt. 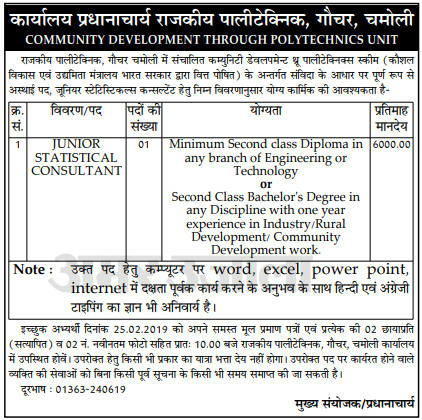 Polytechnic Gauchar Chamoli". We would be glad if you can comment below and provide your valuable suggestions and feedback. If this page have any wrong information/list or out of context content, then you can report us as well.